Bear's Paws: My Dog Just Ate WHAT!? Your first instinct is to yell something along the lines of “NO!” or “DROP IT!” but 8 times out of 10, by the time you reach Fido, he’s already swallowed his tasty new treat and is rather smug about it. We can spend hours talking about training techniques and how to get your dog to ignore things that smell yummy and delicious, but fact of the matter is: dogs are dogs. If they catch the scent of something they like, no amount of training will stop them. 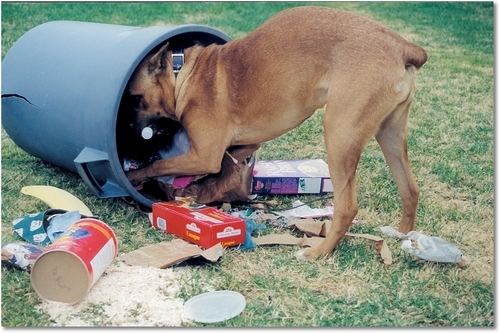 The important thing is how you react to Fido’s impromptu snacking. First, you MUST remember to stay calm. Becoming agitated will not encourage your dog to trust your reactions n any situation. Try to figure out what it is that your pooch just had in his mouth – there is more often than not, some sort of indication to be found – whether it is some old dog poop, garbage, random pieces of old food left on the side of the road, road-kill, or some other small dead mammal (Bear likes to try for the last one rather often). Remember that your dog still has some wild instincts in him, and dogs are hunters and scavengers and their instinct is to eat what they find. One thing that you must keep in mind is that dogs have much stronger constitutions than we give them credit for. Yes the stuff they are putting in their mouths is absolutely disgusting, but they also have systems that can handle much more than we think. For the most part, I (and most vets) would suggest simply keep an eye on your pooch for a good twelve hours. If there are no changes in behavior, no excess vomiting or diarrhea, your pup’s system has dealt with whatever it was that he decided to ingest. If at any point you notice any of the above listed symptoms then get in touch with your vet immediately. If, upon inspection of Fido’s impromptu snacking grounds, you see or smell any chemical residue, contact your vet immediately. Teaching your dog’s certain cues, such as “leave it” can be extremely useful in certain situations and comes highly recommended by any trainer or vet. Just keep in mind that there is no such thing as the “perfect cure-all” for natural doggy behavior. I've had great luck with using tone instead of any form of training to get an instant "leave it". In my old neighborhood, things were serious as people poisoned rodents and left poisoned meat for coyotes. Great recall and tone made things very reliable, especially so if you throw bond into the mix. With my first dog, we had a good recall and were working on leave-it. One time he picked up some meat left on a plate behind a tree, and because we didn't have a solid leave-it, I used my "fishmonger's wife" voice "GET THAT OUT OF YOUR MOUTH" - he looked at me, and the meat dropped right out of his mouth. This was a lab/beagle mix -- he lived to scrounge and eat inappropriate things, it was his favorite and most rewarding activity. Later I learnt about how the meat could have been poisonous, so I was extra relieved it worked so well. I'm not saying "don't be calm" - I agree you don't want to freak out - but remain confident and calm and mean *business*. Reserve the "fishmonger" tone for critical stuff, as I wouldn't be surprised if one reason it works well due to the element of surprise and how attention-grabbing it is. But at all times, be super clear about what you want (potentially dangerous food out of that mouth, or at least stopping chewing so maybe you can remove it before swallowed) when you use your tone and body language if they're looking. I know that some might not like the less-positive nature of 'tone of voice' (etc), even I don't, but I've heard of and seen dogs knock on death's door or worse from what they pick up - more often than not they're fine, but it's not unheard of. One of my previous dogs nearly died from eating a dead crow, as after a million diagnostics the vets couldn't figure out how to treat him. The sweet sounding "Leave it" with a pocket treat will not be nearly as rewarding as the delicious dead bird, the bird and the natural instincts you mention will win without a pretty big time distraction. Personally, I'll want to do whatever I can to keep them from eating that stuff, even if I have to take the role of fishmonger once in awhile.